SHIFT | HAPPENING | NOMAD OR ANTINOMAD? Commercial globalisation is a key phrase among social activists and anarchists, especially now that commercial air-transport enables campaigners to move from continent to continent to protest at international-trade meetings they once could not have got to. An art show on until July 28th at Budapest’s Knoll Gallery is not ostensibly about globalisation. But it is hard not to see some influence from the ideas of the new internationalism, an internationalism which believes in the free trade of ideas but fears the free trade of goods and services. The show is sarcastically titled “An artist who does not speak English is not an artist”, named after one of the exhibits – a banner by Croat artist Malden Stilinovic with something very close to that slogan emblazoned across it – in English of course: a true piece of self-questioning conceptual art if ever I saw one. 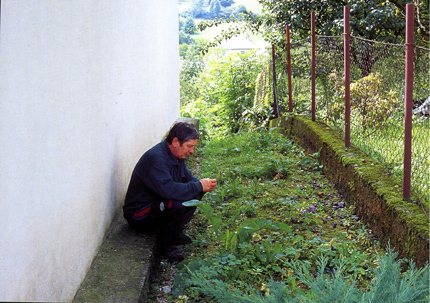 In the exhibition a group of artists from mainly ex-communist countries have each contributed a powerful and thoughtful piece about languages, foreignness and internationalism. What does national identity mean, and what is the international language of art? Is it English? Or is it English plus certain other cosmopolitan assumptions shared by art curators, artists and art buyers worldwide? Already in Eastern Germany, future showings for the exhibition are planned for Tallin, Estonia, and Prague, the Czech Republic. Luchazar Boyadijev from Bulgaria mounts a wall-sized black-and-white set of photographs and photocopies of letters and permits, documenting years of travel between various art galleries, installations and art-study internships. He himself stands lifesize at one end, looking rather forlorn, behind a grid of Bulgarian currency exchange rates superimposed on his photo. Kai Kaljo from Estonia made a video in which people who cannot understand each other’s languages (Estonians talking to Russians, Russians talking to Italians) have to relate to each other a story – a truly extreme version of the game known as Chinese Whispers among English children. Muscovite and Viennese provocateur duo Alexander Brener and Barbara Schurz contribute a series of lively drawings in which slogans criticising English as the language of the international system, and yet extolling English as the language needed for organising global solidarity against that system, are drawn in brightly-coloured crayon. Half-Syrian and half-Hungarian artist Roza El-Hassan and her Serbian artist colleague Milica Tomic have a series of photographed meditations on identity and overpopulation culminating in a pointed poster that recently showed in Vienna. Reminiscent of the by-now-well-known www.adbusters.org, El-Hassan and Tomic [Tomic is dressed in Yugoslav partisan’s uniform] had themselves digitally inserted into an existing party-political poster of the cheery far-right Austrian politician Haider, squeezed happily into the front passenger seat of his Porsche car. 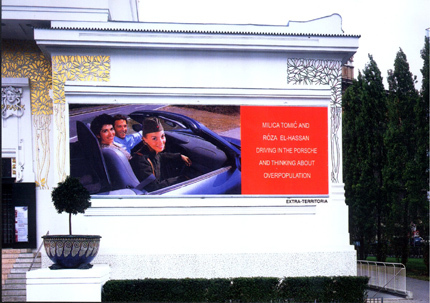 Having overpopulated Mr Haider’s car, the resulting altered picture was displayed on the side of a Vienna gallery for all to see, with a slogan proclaiming the two artists to be “thinking about overpopulation”. Yes, the slogan is in English. But while right-wing Austrians may be thinking about nomadic East Europeans migrating to the “West” (wherever that starts) one Slovak artist at the Knoll show had his own quiet response. 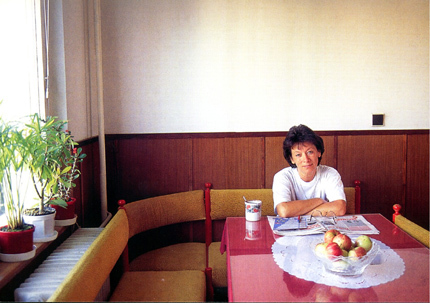 A series of normal postcards, on sale for a normal price (just under twenty US cents) each show a normal Slovak person photographed by Roman Ondak, mostly at home in their slightly-sparse but comfortable-looking communist-era apartments. Showing striking mutedness, Ondak’s name is not even on the cards, which are all entitled ‘Antinomads’. The individual Slovaks look thoughtful and settled, not about to go anywhere, hardly about to pop over to Vienna to help overpopulate Haider’s Porsche. The postcards, of course, can travel the world in their place.